Sure enough, some romantic souls are trying to turn Key Bridge into a Lock Bridge. A Lock Bridge, for the uninformed, is a relatively simple and romantic gesture. 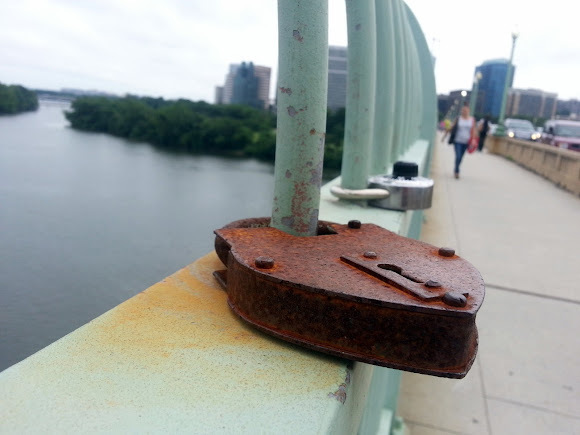 You and your sweetheart take a lock, attach it to the bridge and throw the keys into the river below. You can't unlock the lock, so you have no choice but to stay happily in love (or something like that). In a town filled with broken promises, this is a pretty bold move to make. No, not the twosome who took the time to use a vintage lock. That was sweet. I'm talking about the couple right behind them that used a combination lock. With no keys to throw overboard, unlocking it is a simple task. For a city who's primary export is politics, this easy-off arrangement is just about perfect.